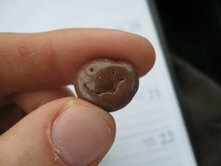 Candy Smiley, A chocolate covered raspberry…. with a great attitude. How quickly it went from a snack to a good luck charm!